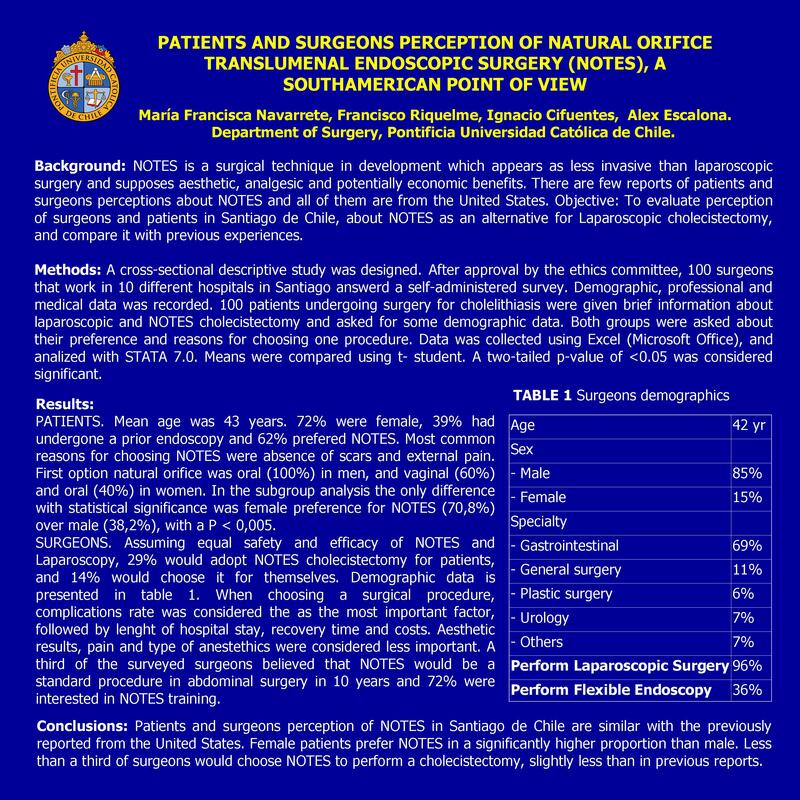 Patients and Surgeons Perceptions of Natural Orifice Transluminal Endoscopic Surgery (notes), a Southamerican Point of View. Introduction: Natural orifice transluminal endoscopic surgery (NOTES) is a surgical approach in development which appears as less invasive than laparoscopic surgery and supposes aesthetic, analgesic and potentially economic benefits. There are a large number of reports detailing surgical procedures and technologic development surrounding NOTES, but there are only a few reports about patients and surgeons perceptions about this new technique and all of them are from the United States. The objective of this study is to evaluate the perception of surgeons that work in 10 hospitals in Santiago de Chile, and patients that consulted in the public and private hospitals associated to Universidad Católica de Chile, about NOTES cholecistectomy as an alternative for laparoscopic cholecistectomy. Methods and Procedures: After the approval of the ethics committee, a 100 surgeons that work in 10 different private and public hospitals in Santiago were given a questionnaire and asked about some demographic, professional and medical antecedents and 100 patients that consulted with demonstrated cholelitiasis for surgical resolution were asked to answer a survey with brief previous information about laparoscopic and NOTES cholecistectomy and asked for some demographic data,and their preference and reasons for choosing one ofboth procedures. Results: Of the 100 patients, 62% preferred NOTES and 38% laparoscopic surgery. The mean age was 43 years, 72% were female, 35% had completed a university career, and 39% had undergone a prior endoscopy. The most common reasons for NOTES selections were the absence of scars and external pain, and the preferred orifices were for men 100% oral and for women 60% vaginal and 40% oral as first option, neither choosed the rectal orifice as the first option. Of the 100 surgeons, only 29% would choose NOTES for a patients cholecistectomy and less than half of them would choose it for themselves, supposing NOTES technique as safe and effective as laparoscopic cholecistectomy. Their mean age was 42 years, 85% were male and 69% Adult Digestive surgeons. When choosing a surgical procedure they considered the complications rate as the most important factor, followed by duration of hospitalization and recovery time, and costs. Aesthetic results, pain and type of anesthetics were considered less important. A third of the surveyed surgeons thought that NOTES would be a standard procedure in abdominal surgery in about 10 more years and 72% of them are interested in NOTES training. Conclusions: The results in our Chilean experience about patients and surgeons perceptions about NOTES do not significantly differ with the previously reported from the United States.